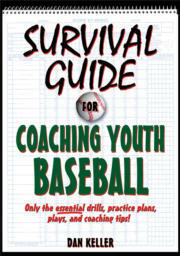 In Survival Guide for Coaching Youth Baseball, longtime coach Dan Keller shares his experiences and provides advice you can rely on from the first practice to the final game. From evaluating players’ skills and establishing realistic goals to using in-game coaching tips, it’s all here—the drills, the strategies, and most important, the fun! Develop your team’s fielding, catching, throwing, pitching, and hitting skills with the Survival Guide’s collection of the game’s best youth drills that young players can actually use. Best of all, you’ll be able to get the most out of every practice by following the ready-to-use practice plans. Chapter 9. Game Time! What’s My Role Again? Keller’s work has been featured extensively in Collegiate Baseball Newspaper, Junior Baseball Magazine, and several online publications. He’s also a frequent instructor for a number of youth clinics. In his free time he enjoys staying active by hiking and playing basketball, softball, and golf. Keller lives in California with his wife, Erin.